Colombo: President Mahinda Rajapaksa on Monday ordered the release of 78 Indian fishermen held by the navy for allegedly poaching into Sri Lankan waters as a goodwill gesture to mark the joint session of the Indian Parliament. The decision came a day after Tamil Nadu Chief Minister Jayalalithaa wrote to Prime Minister Narendra Modi seeking a "permanent solution" to the thorny issue. Rajapaksa tweeted: "On the occasion of the 1st joint sitting of Indian Parliament, I have instructed officials to release the 78 Indian fishermen in SL custody." Colombo, April 13 - The Sri Lankan government Saturday said it has no faith in an international investigation into the alleged human rights abuses occurred during the civil war in the country. President Mahinda Rajapaksa's special envoy on human rights and Government Minister Mahinda Samarasinghe said that Sri Lanka feels an international investigation will lack credibility and will not be independent, Xinhua reported. Samarasinghe was speaking to reporters after meeting some of the island's leading Buddhist monks and briefing them on the latest developments in the country. Nay Pyi Taw, March 4 : Even as the Sri Lankan Navy arrested 32 more Indian fishermen, Prime Minister Manmohan Singh raised the issue with the neighbouring country's president, Mahinda Rajapaksa, here Tuesday, calling for a humane approach to the issue. Meeting on the margins of the BIMSTEC Summit, the two leaders also spoke about the upcoming US-led resolution at the United Nations Human Rights Council, the text of which was released to member countries late Monday. London, Nov. 15 : Sri Lankan President Mahinda Rajapaksa has hits out at critics who questioned the country's human rights record during the Commonwealth summit. Speaking to reporters ahead of the Commonwealth Heads of Government Meeting (CHOGM) in Colombo, Rajapaksa said Sri Lanka has a legal system and it should be respected. He said that if anyone wanted to complain about human rights violations in Sri Lanka there was a system in the country. He said his government ended killings in the country by defeating Tamil Tiger rebels in 2009. Colombo, Sep 4 : Sri Lanka has decided to resume playing cricket in Pakistan after a four year gap. President Mahinda Rajapaksa stated this here Tuesday to Pakistani minister Ahsan Iqbal, the Associated Press of Pakistan (APP) reported. Rajapaksa said a Sri Lankan team will soon play in Pakistan. Sri Lanka stopped sending its cricket team to Pakistan after the March 2009 terror attack on its squad in Lahore that injured six of its players and left six Pakistani policemen and two civilians dead. New York, Aug 10 : The Sri Lankan government should promptly create an independent and transparent inquiry into the deaths of protestors at Weliweriya Aug 1, Human Rights Watch said Sunday. At least three people were killed and several injured after security forces fired live ammunition at protestors who were demanding access to clean drinking water. According to news reports, soldiers fired on local residents and Buddhist monks who were demonstrating for clean water on the Colombo-Kandy Road in Weliweriya, Gampaha district, about 25 km from Colombo. Colombo, June 21 : Sri Lankan President Mahinda Rajapaksa has mourned the large number of deaths and destruction to property in severe floods in northern India. In a letter to Prime Minister Manmohan Singh, Rajapaksa expressed condolences on account of the unprecedented natural calamity, particularly in Uttarakhand. "The people of Sri Lanka and I are deeply saddened by the loss of life and property ... in Uttarakhand as well as parts of Himachal Pradesh and Uttar Pradesh," he said. "We in Sri Lanka share the grief of the people of India at this time of grave distress. Bangkok, June 1 : Thailand and Sri Lanka have agreed to expand bilateral and multilateral cooperation on religion, trade and investment, and education, Xinhua reported Saturday. Prime Minister Yingluck Shinawatra held talks with Sri Lankan President Mahinda Rajapaksa on a variety of issues in Colombo, it said. The Thai leader Friday hailed the Sri Lankan government for its success vis-a-vis Tamil separatists. 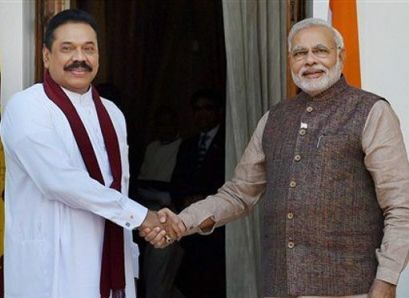 Colombo, May 19 : Sri Lankan President Mahinda Rajapaksa Saturday renewed his pledge to fight all "external elements" seeking to "disrupt" the country's peace. Speaking on the fourth anniversary celebration of winning the three-decade war against Liberation Tigers of Tamil Elam (LTTE), Rajapaksa was alluding to foreign countries, led by the US, Xinhua reported. Some countries have been critical of Sri Lanka's human rights record and called for an independent investigation into the alleged war crimes committed during the last stage of the war in the country. Colombo, March 27 : Sri Lankan President Mahinda Rajapapaksa Wednesday warned of local and internationally attempts to scuttle peace in the island nation. Addressing a Sri Lanka Freedom Party ceremony here, Rajapaksa said it was the right of all Sri Lankans to ensure that peace was protected in the country without falling prey to rumours, reports Xinhua. He recalled that during the civil war, a lot of pressure was exerted by some countries on Sri Lanka. But the government stood firm in achieving its objectives and protected the interest of its people in the process. Tirupati (Andhra Pradesh), Feb 9 : Sri Lankan President Mahinda Rajapaksa Saturday offered prayers at the Lord Venkateswara Temple atop Tirumala Hills here. Accompanied by his family members, he had 'darshan' in the early hours of the day. They also took part in the 'Suprabhatha Seva', the temple officials said. The priests offered 'prasadam' to the visiting dignitary. Earlier, the officials of Tirumala Tirupati Devasthanam (TTD), which manages the affairs of the famous temple, welcomed Rajapaksa. Sydney, Feb 5 : Sri Lankan President Mahinda Rajapaksa has ruled out giving Tamils greater political autonomy. By doing so he backed away from his long-stalled promise to empower the ethnic minority as part of the country''s reconciliation process following a bloody civil war. Rajapaksa's decision came despite growing international pressure to compromise with the defeated minority and to investigate allegations of war crimes. Indian Army chief General Bikram Singh is on a four-day visit to Sri Lanka starting Wednesday, seeking further strengthening of military ties between the two countries. The Indian Army chief's visit to the island nation assumes special importance in light of ongoing defence cooperation between the two nations. Colombo, Aug 24 : Sri Lanka would soon set up committees led by Members of Parliament to investigate series of vigilante violence, sparked by a fear of night-time prowlers known as "grease devils". The BBC quoted President Mahinda Rajapaksa as saying that committees led by government MPs will work with police to tackle the problem plaguing rural areas in Sri Lanka. The "grease devils" have been accused of assaulting women at night in recent weeks, and residents have accused the security forces of involvement in the attacks. It has been reported that Sri Lankan President Mahinda Rajapaksa convinced a member of his Cabinet Saturday to end a hunger strike over U. N. allegations of human rights violations. A groundswell of support seems to be building up to free the arrested former army chief Sarath Fonseka. But the army is likely to go ahead and initiate court martial proceedings against him, the first four-star general in its history. A board, of three or five members, would be constituted to hear the evidence against Fonseka, accused of planning a coup among other things. The court martial board would be headed by current chief of defence staff (CDS) and Sri Lankan air force chief, air marhsall Roshan Goonetilleke. Chennai, Jan 1 : The Marumalarchi Dravida Munnetra Kazhagam (MDMK) founder, V Gopalswamy (Vaiko), condemned the Union Government for inviting Sri Lankan President Mahinda Rajapaksa and giving a preferential treatment to him at the famous Tirupati temple. Addressing the media here, Vaiko contended that the Union Government by keeping in view the state of Lankan Tamils should not have extended such a privilege to Rajapaksa. Toronto, Dec 14 - Sri Lankan Tamils in Canada have called for an international trial of the Sri Lankan president for allegedly ordering the killing of surrendering LTTE leaders during the ethnic war that ended in May. Former Sri Lankan army chief and opposition presidential candidate Sarath Fonseka has alleged that Defence Secretary Gotabaya Rajapaksa ordered troops to kill three top LTTE leaders when they raised white flags to surrender. The defence secretary is the brother of President Mahinda Rajapaksa. Politics could estrange the most intimate bedfellows. The souring of relationship between President Mahinda Rajapaksa, the commander-in-chief of the armed forces, and his former army chief, Sarath Fonseka, has been rapid. Falling apart less than six months after the defeat of the Tamil Tigers, they are now headed against each other for the January 26 Presidential polls. “Mother of all polls’’, it is being touted as.